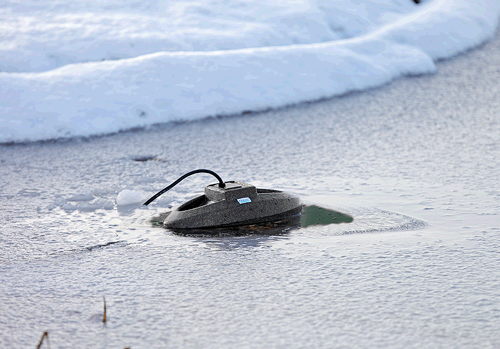 Oase IceFree Thermo Pond Heaters and aerators keep an area of water surface free of ice over winter, to help release toxic gasses in fish ponds. Keeping an area of the pond surface free of ice in winter is important as it allows crucial gas exchanges to occur in the pond such the purging of harmful ammonia and the entry of vital oxygen. The OASE Pond Heaters and Ice Preventers will effectively maintain an ice-free zone on the surface of the pond and also create warmer zones for the pond fish to congregate during the colder months improving general environmental conditions and minimising stress over the winter.